In order to visit South Bend before the end of my unfortunately too short July 4th holiday, I left Milwaukee a few days earlier than the rest of the family. This meant that our last meal together was breakfast at the Simple Café. Sara and I had of course perused the menu beforehand and were impressed by the diversity of items as well as the incorporation of many of our favorite vegetables, cheeses, and grains into the dishes. However, based on the few pictures of the food that we had seen on Yelp and TripAdvisor, we were somewhat wary of the seemingly basic and uninteresting presentation and plating. Luckily, we all took a leap of faith and soon found ourselves walking into the bright and modern little café. Something about the simplicity of the furniture, bright orange, green, and purple color scheme (it was much more appealing than it sounds), and even crafty/DIY feel of the decorations exuded the Simple Café’s youthful and fresh personality. In pouring over the menu, I found myself wishing that I could aggressively mark up, cross off, circle, and annotate the choices until I got enough clarity to make a decision. The more dishes I read about, the harder it became for me to pinpoint a particular ingredient or combination of ingredients that would act as a deal breaker. Consequently, this made it practically impossible for me to guess what anyone else was ordering, a feat I often find fairly simple based on experience and knowledge of everyone’s’ tastes. In the end, we all ordered different egg breakfasts, though each had its own flavor and flair. 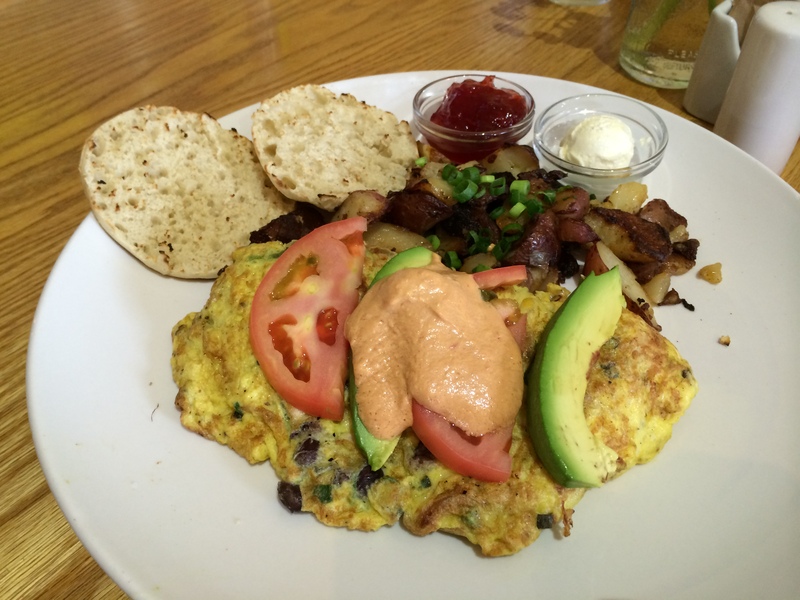 Sara ordered the Seasonal Harvest Frittata (above) with tomatoes, onions, spinach, red pepper, squash, and zucchini. It was topped with sliced avocado, soft goat cheese, and salsa. Finally, it was served over a spinach tortilla with a side of Simple potatoes. While we all agreed that the dish was both delicious and beautiful, we were unsure of the use of the tortilla- the frittata really didn’t need it and Sara ended up leaving it. Brian went with the grilled sweet corn and chicken omelet which was filled with chicken, corn, black beans, onions, green peppers, and pepperjack cheese. It was presented topped with avocados, tomatoes, and a chipotle cream sauce. I ordered the Turkey Fresh Mozzarella Pesto Hash. Two perfectly over-easy eggs topped a heaping portion of potatoes, turkey, swiss chard, red onion, tomatoes, and cubed mozzarella all tied together with fresh pesto. When the soft egg yolk broke over the hash, the salty pesto, rich yolk, and added hot sauce mingled together to create the perfect combination of flavor and texture. 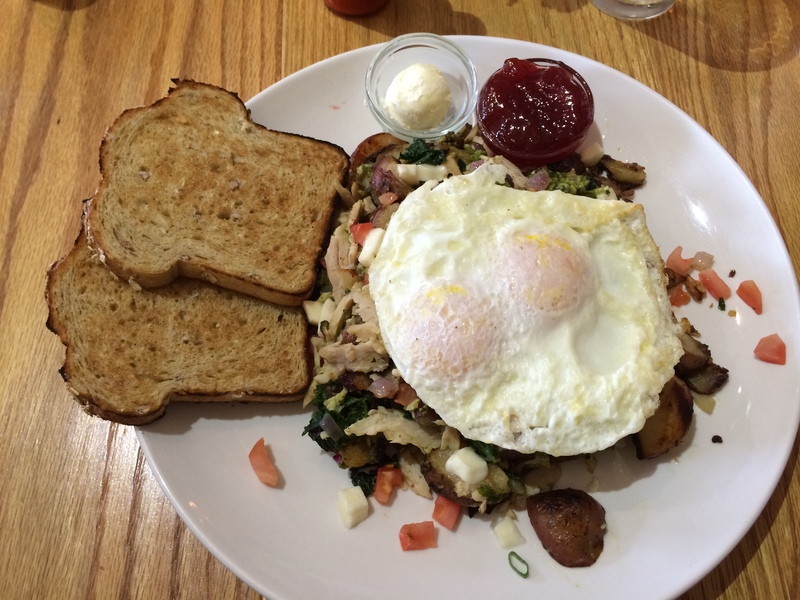 Because of the diversity of items in the hash, each bite gave way to a new taste or emphasized ingredient, making this breakfast both interesting and delicious to the last morsel. 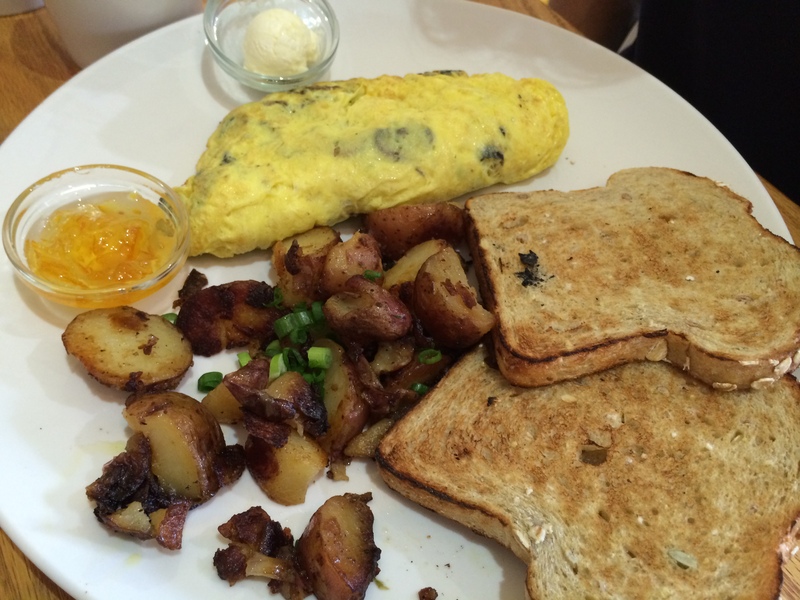 Mom ordered the 3 Mushroom omelet (shiitake, oyster, and button variety) which also included shallots and gruyere cheese. 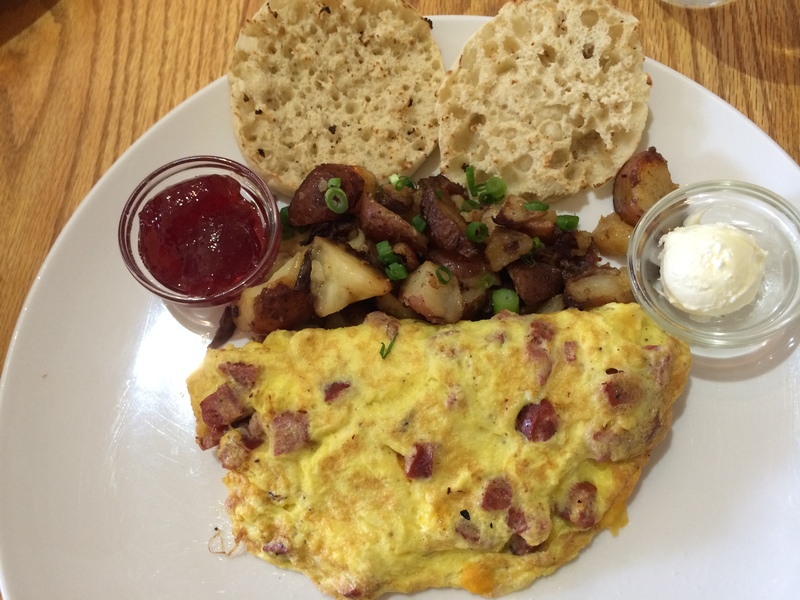 Although I can’t remember exactly which vegetables and cheese ingredients went into Dad’s “Designer Omelet”, I do recall that the highlight of the omelet was the abundance of chorizo. The sausage had a little spice and a little sweetness, making Dad quite the happy camper. For anyone passing through Milwaukee, I would highly recommend making a point to stop at the Simple Café. The plates were by no means unconventional, however they did utilize a large variety of fresh ingredients that interacted well together. While I felt stuffed afterwards, I truly felt full of good, fresh food, rather than weighed down by over-seasoned, ingredients. The specificity of the menu made me feel like I knew what every ingredient on my plate was, and that there were no added artificial ingredients, fillers, or surprises. This approach to the menu and offerings indeed exudes simplicity and fosters the belief that any of these meals can be made in the comfort of one’s own home.